The Opening Reception for the 2015 New York City Regional Exhibition took place on Friday, March 20th at The Metropolitan Museum of Art. Despite the late March snow storm, we had a wonderful turn out of students and educators and their friends and family. Sandra Jackson-Dumont, the Frederick P. and Sandra P. Rose Chairman of Education at the Met, welcomed all the Scholastic recipients to the front of the room to be recognized for their artistry and creativity. The Deputy Chancellor for Teaching and Learning at the New York City Department of Education, Phil Weinberg, spoke on the importance of nurturing creativity in teens, and Joel Towers, the Executive Director of Parsons The New School for Design, touched on the need for creativity in this innovative time. Students took part in a printmaking activity led by the Met’s education department. 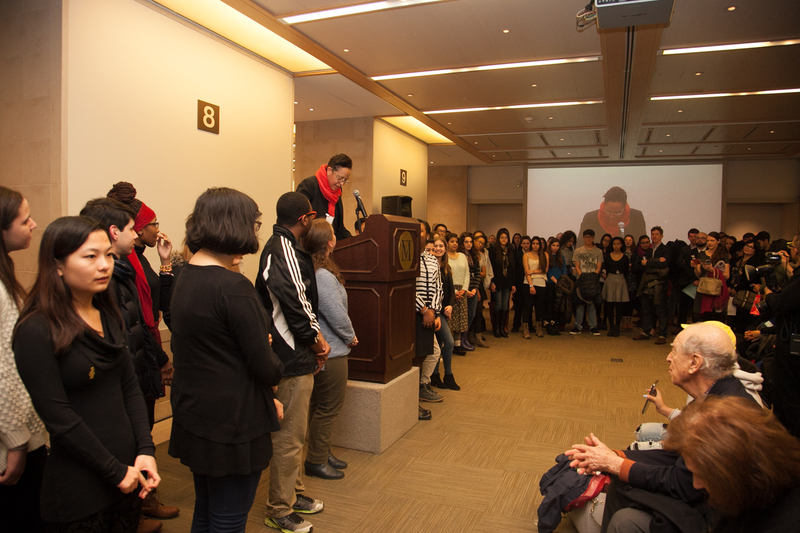 The Gold Key Portfolio Recipients and NYC American Voices Nominees read in the Nolen Library to intimate crowd and in the Art Study room, which was simulcast throughout the Uris Center. The Gold Key art and writing took center stage! Thanks to everyone who came out! The Exhibition will be open through May 17th. Please stop by and visit the Uris Center for Education at the Met anytime during Museum hours to see the wonderful art and writing of out NYC students!